Bet Am Shalom synagogue is honored to be housing a Torah from the city of Prostejov, Czechoslovakia which was rescued after the Shoah. Prostejov (called Prossnitz by the Germans) was a small manufacturing city in southern Moravia, approximately 20 kilometers southwest of Olomouc and 60 kilometers northeast of Brno. Prostějov's Jewish presence began during the late 15th Century and, until the imposition of marriage restrictions on the Jewish population in the mid-1800's, had the second largest Jewish population in Moravia (about 30% of the total population). By 1900, some of the Jewish population in Prostějov had dispersed to other communities, and then totaled 1,680 people (7% of the total population). In 1930, the Jewish population was 1,442. In all, approximately 1,430 residents of Prostějov were killed by the Nazis, with over 1,200 of them Jewish. The current population of Prostějov is almost 50,000, and the city has few if any Jews. The old Jewish Quarter was almost entirely demolished in the early 1990s. 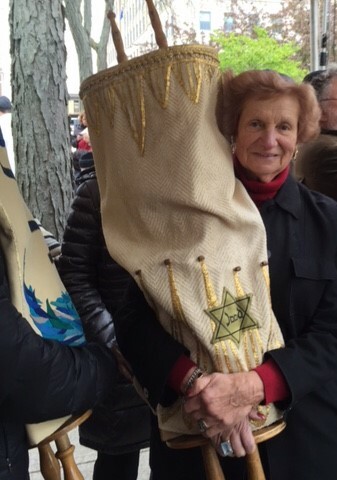 The Torah, obtained by member David Kligler, MD z”l, was donated to Bet Am Shalom Synagogue in memory of Ethel Neufeld Stark z”l, mother of member Bernie Stark z”l . 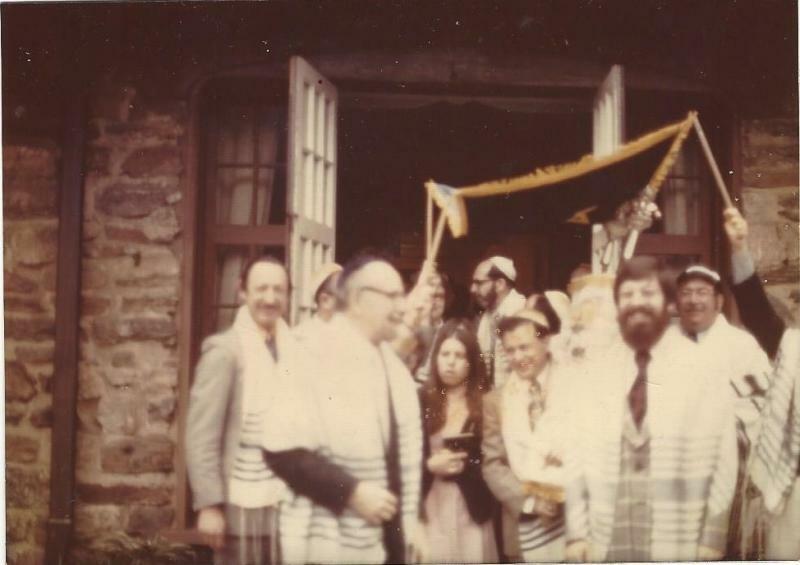 On the morning of Shavuot, May 27, 1974, this Torah was dedicated. At the dedication ceremony the Torah was carried under a Chupah through our gardens before it was read. Rabbi Arthur Zuckerman then related its probable history: The Germans, he said, had stored it in a warehouse during the war in the hope of selling it. It had finally been liberated by the Americans. 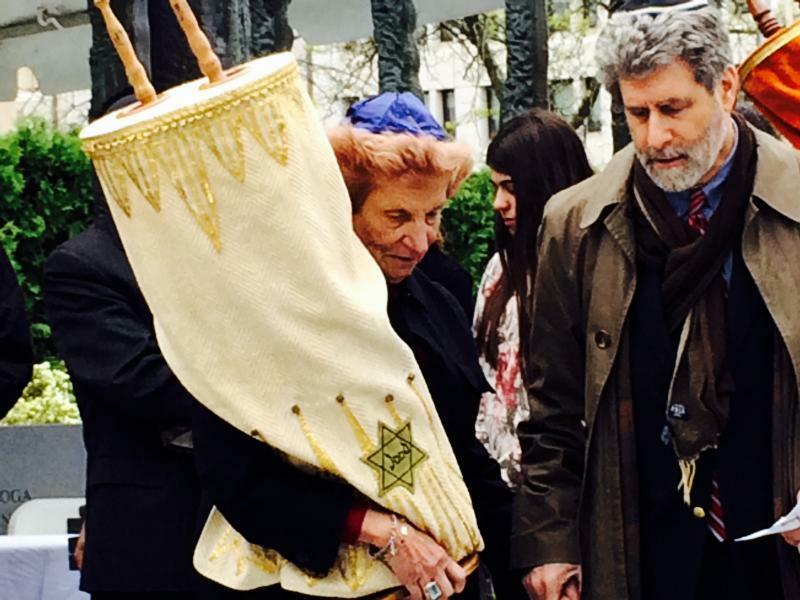 The torah, carried by Laure Kaminsky accompanied by Rabbi Lester Bronstein, in a procession commemorating Yom Hashoah. We feature this Torah on Yom Kippur, Yom Hashoah and Tisha B’av. 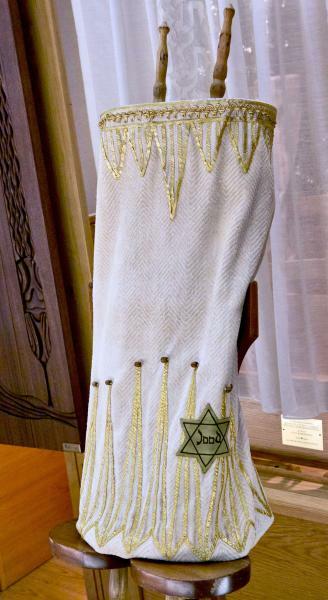 This Sefer Torah, Scroll Number MST#638, is on loan from the Memorial Scrolls Trust.